At the 2017 International Pool and Spa Show, we had the chance to speak with John Kane, the National Sales Manager with Raypak and asked him a few questions regarding their internet warranty policy. Still, even if you are purchasing a pool heater online, there are still some guidelines you have to abide by. These guidelines not only keep your warranty in place but also help extend the longevity of your pool heater. In fact, the quickest way to void your heater’s manufacturer warranty is by hiring an unlicensed person to install your heater. Some pool owners assume that experience replaces a license. Unfortunately, this isn’t true. In order to keep your warranty intact, hire a licensed professional to install your heater. Raypak requires a licensed professional because it decreases the margin of error during installation. Because the warranty does not cover any damages that occur during installation, it’s probably best simply to go with a licensed installer. If you’re having trouble locating an installer in your area, feel free to call Raypak at 805-278-5300. 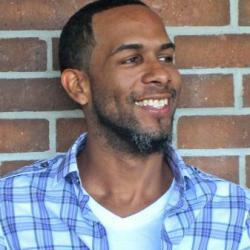 If you give them your zip code, they will provide you with a certified installer in your area. One of the leading issues that lead to heater failure is chemical damage. 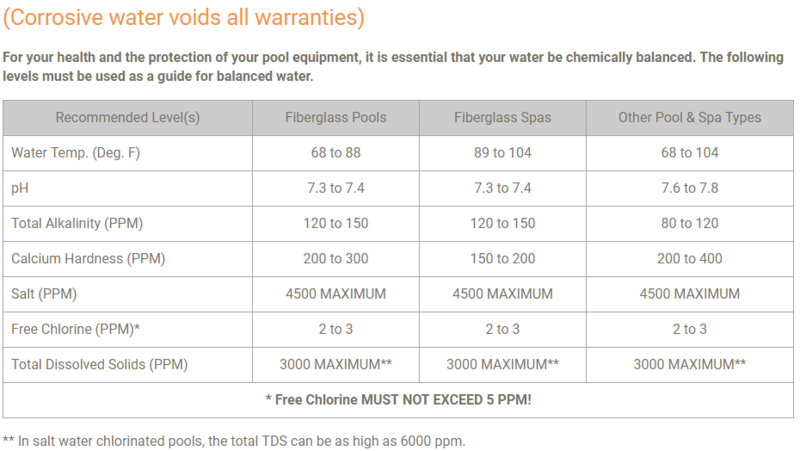 It is extremely important for pool owners to maintain proper chemical levels in their pool. If you do not maintain your pool correctly, the heater is one of the first pieces of equipment to go bad. Sure, a cupro-nickel heat exchanger withstands the harshness of saltwater. However, even a cupro-nickel heat exchanger isn’t strong enough to handle poor water chemistry. In fact, Raypak’s website provides the chemical levels that they recommend for optimal performance. If you are installing a pool heater, we also recommend installing a check valve. The purpose of a check valve is to prevent backwash of unwanted waste. In terms of a pool heater, we recommend pool owners install a check valve between their salt system and Raypak heater. 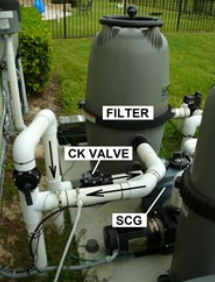 When you turn the pool pump off, the water in your chlorinator or salt system may return back to your pool heater. At that point, it may sit and eat away at your heat exchanger. Inspect your heater as soon as it arrives. Yes, even if the package arrives in perfect condition and even if you aren’t planning to install it until the following year. The last thing you need is to open your heater to notice one of the unions arrived cracked. A simple inspection when the unit arrives saves you any additional hassle down the line. Call a licensed installer AFTER you receive your heater. I know it’s human nature to plan ahead. However, based on our experience, it’s easier to wait until you have your heater before calling your installer. There are a few reasons for this. In many instances, homeowners take a day off of work and wait for delivery with their installer in place. Installers typically charge pool owners a flat fee, even for a visit. You can avoid an installer charging you a home visit fee in the event that your heater doesn’t arrive. Additionally, if your heater arrives damaged (it’s not common but it does happen) you’re not in jeopardy of an installer charging you for a visit. We cannot stress enough how important it is to balance and maintain your swimming pool. If you are having troubles balancing your pool, please review our articles to review the recommended chemical levels and how to achieve them. Don’t forget to install your check valve. Trust us, you (and your heater) will be glad you did. Since there are several different kinds of check valves, we have a guide that looks at the functions and descriptions of each check valve. Raypak recommends new Raypak owners to register their heater online for warranty purposes. Doing this proactively creates an account for customers in case they need technical support in the future. The process isn’t long at all. The Scope of Warranty: Raypak only warrants the original heater owner. The warranty is not transferable. If you’re on the hunt for a good pool heater, don’t be afraid to purchase one online. Buying online can literally save you hundreds of dollars. Unfortunately, even if you purchase in store, you must still have a licensed installer perform the installation. The warranty limitations apply to any new pool heater owner. Raypak is a great heating company and we firmly stand behind their products and warranty services. If you need help sizing your heater or need a recommendation, give us a call or leave us a comment below. I have a 52 wall 18×33 above ground 6ft deep end pool , my question is why don’t they have pretty liners for us with deep ends ? Should I get a larger liner like a 54 wall ?